There are many design decisions involved in creating a new magazine. When Melanie Paticoff, editor of a new publication Hearing Our Way (HOW), contacted me, I didn’t hesitate. What a fun, creative design opportunity! The first issue was a prototype issue. While future issues would be more theme-based, the first one needed to just be all about HOW’s brand and concept. This was to be the only magazine for kids and teens with hearing loss (a very niche market). HOW’s prototype did not have advertising. Its purpose was promotional—to build readership (via email sign up) and attract future advertisers. 1. Magazine page size and page count: The most economical printing solution for the prototype was eight 8.5×11-inch pages. 3. 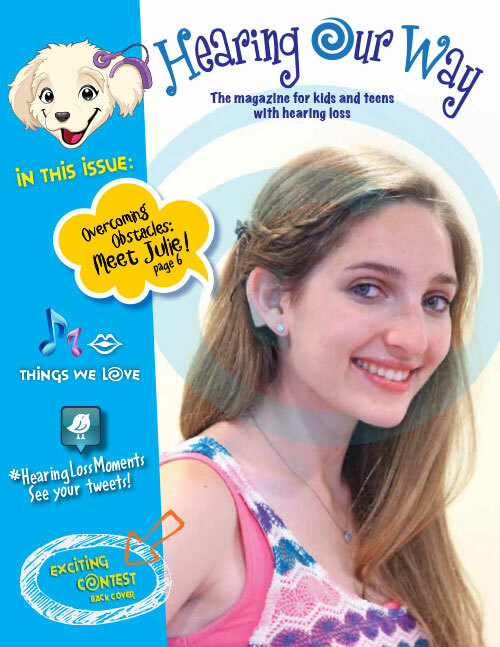 Cover design: The Hearing Our Way nameplate plus the tagline, “The magazine for kids and teens with hearing loss,” were placed above a close-up portrait of Julie, a teen (and Melanie’s cousin) who posed so that her cochlear implant was visible. Julie was also the main feature two-page article. A side-column preview, “in this issue,” was sprinkled with small graphic icons. 4. Color palette and typefaces: One of the early challenges we faced was how to bridge the original Sophie’s Tales picture books with the new magazine product. We wanted to build on our trusted brand, but the demographic was shifting from younger children to older tweens and teens. That’s when we took the original colors, light blue and light purple, and punched them up to the more vibrant blue and purple that would appeal to this audience. We made similar changes with the font, from the curly, babyish Sophie’s Tales font to the fun but teen-friendly Hearing Our Way font. The interior pages provided a perfect opportunity to use a variety of fun, funky typefaces, some in bold colors that complemented the blue and purple. We chose ITC Officina Sans for the body copy because it is a friendly, easy-to-read font. 5. Graphics: HOW is loaded with visual graphic elements. I asked Melanie to help look for graphics on ThinkStock.com and make a lightbox with her favorite images. Using these visuals helped to speed up the design process. As an example, we used a cork-texture, bulletin-board background; notebook paper; pushpins; and tape. 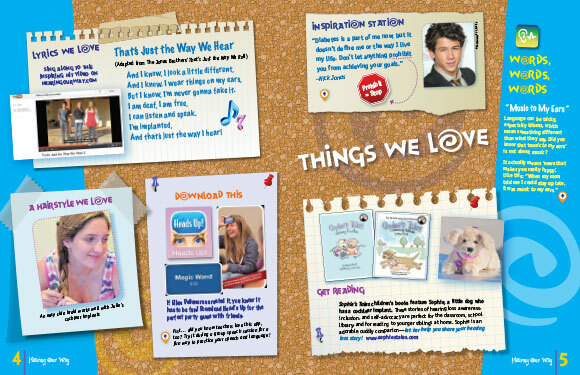 or the article, “Things We Love,” we segmented each text blurb and enhanced it with photos and small, spot graphics. Results: Hearing Our Way is a success! A recent press release stated, “Following a successful ‘prototype’ first issue that launched in April, distribution has reached more than 5,000 people worldwide, encompassing 49 states and 27 countries.” N-K was truly honored to design this magazine. Are you ready to launch a magazine? Let’s talk! N-K is ready to help you. Contact us at 314-548-6001. PreviousPrevious post:Rebranding a logoNextNext post:Last-minute print ad?